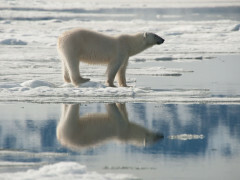 Why North Spitsbergen - Polar Bear Adventures? There’s two types of people - Watchers and Go-ers. Watchers witness the world go by watching PBS wildlife documentaries from their sofas while Go-ers rebrand the initials PBS into their very own Polar Bear Special. Which will you be today? Do you want to see your wildlife on the TV or get up close and personal with polar bears, whales and walrus just 540 miles from the North Pole? Setting out from Svalbard’s most beautiful town; Longyerbyen, (and its Polar Bear Museum) you’ll spend eight days and seven nights aboard the ice-strengthened cruise ship The Ortelius. In Isfjorden, you may see Minke Whale while polar diving in Raudfjord and are certain to see Ringed and Bearded Seals while snowshoe hike. What makes the trip so utterly amazing? Make sure you have your camera at the ready at all times as Polar Bear walk the impressive Monaco Glacier as you cruise alongside its 5km long face. In the Hinlopen Strait, you’ll navigate the ice floes of Lomfjordshalvøya in zodiacs and explore the bird cliffs of Alkefjellet. Then it’s on to St John's Fjord and Seven Islands (81 degrees north and the closest you’ll get to the North Pole!) 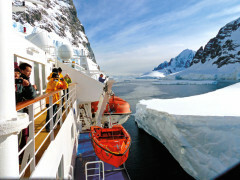 where you’ll see Greenland Whales, Blue Whales and Fin Whales - so many whales that you’ll practically be Welsh! With Arctic Foxes, Reindeer, Pink-footed Goose, breeding Ivory Gull and Walrus all on the menu… doesn’t that sound a better life than a TV dinner and documentaries? See Arctic Foxes, Reindeer, Pink-footed Goose, breeding Ivory Gull and Walrus!